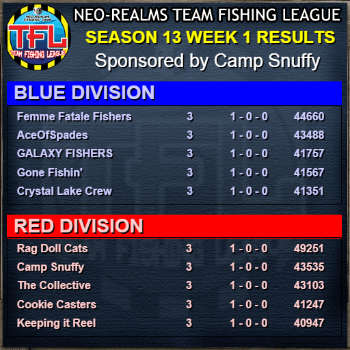 Welcome to Season 13 of the Neo-Realms Team Fishing League for Second Life! The Neo-Realms Team Fishing League (TFL) is a competitive, team-based tournament league for Neo-Realms Fishing. Players compete in 2v2 matches over the course of a season, with prizes going to the league victors. TFL Season 13 has begun! TFL Season 13 is now underway! One difference this year is that you can fish all of your season's matches at any time. Only one match is due before next Monday, and since we have 11 team divisions there will be one team in each division with a bye for the first week. Good luck to all teams this season! 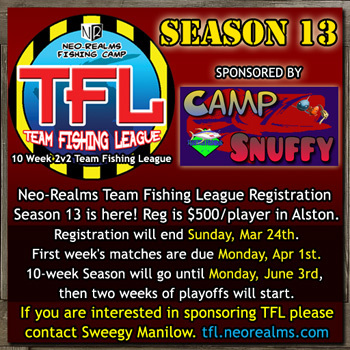 TFL Season 13 Registration underway! Sponsored by Camp Snuffy! TFL Registration is now open in Alston! Registration is $500L per person and will end Sunday, Mar 24th. Feel free to take a copy of the TFL info board next to the registration vendor, it will update with TFL scores and news weekly! One thing new in Season 13 is that all matches will be available to fish at the start of the season. Matches will still have a deadline depending on the match week, but you may fish them at any time in case you are unable to compete during a particular week. The Neo-Realms Team Fishing League (TFL) is a competitive, team-based tournament league for Neo-Realms Fishing. Players compete in 2v2 matches over the course of a season, with over $12,500L + all registration fees in prizes going to the top teams and league victors. Grab a partner and register today!